The rise of false teaching and heresies in China underlines the need for greater access to affordable Bibles for China’s poor. Chinese Christians recognise that the Bible is the key basis from which to grow in faith and draw wisdom for their daily life. God’s word is also the bedrock of their strength in resisting false teachings and heresies, which are problems in the Chinese church. But so many Christians cannot afford to buy a Bible for themselves, much less buy a spare one to give away. This year, Bible Society Australia wants to provide 2.7 million Bibles at an affordable price to Christians in China, particularly those in rural areas. It also wants to give away about 50,000 Bibles to those in need. 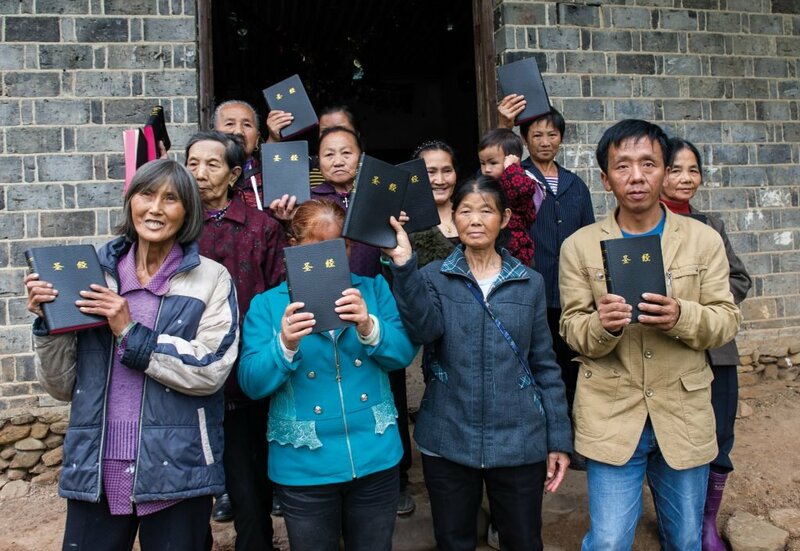 Some of the members of Luo Shui Church with Bibles they have received from Bible Societies. Thirty Christians meet regularly in this small farmhouse that serves as the building for Luo Shui Church, some of them walking for hours through the mountains each week to get here. Members can only reach the church by using stepping stones to cross a stream, and most of them are very poor. Wang Handong, pictured left, is a lay preacher at a church in Wuhan, the sprawling capital of Central China’s Hubei province. Today he loves nothing more than giving away Bibles to people who do not know Christ. But 18 years ago, Wang was a stubborn atheist who refused to read the Bible. As a young executive battling to mend strained relations with his family, Wang fell into a depression after a break-up with his girlfriend. Desperately seeking happiness, he accompanied a friend to a service at the Zhong Nan Theological Seminary. It was there he first heard the gospel and was given a Bible, a gift that Wang dismissed as useless because it could not be exchanged for money or pleasure. Despite his reluctance, Wang kept going to the weekly meetings at the Bible college, encouraged by the students’ persistent phone calls and invitations, but for six months he continued to reject the gospel and refused to read the Bible. Finally, he relented and began to open up God’s word. “I did not understand the first five books, but when I came to the book of Psalms and Proverbs, my spiritual eyes began to open,” Wang said. “I did not know what possessed me. I ran up to the pulpit, knelt down before the cross and cried my heart out. At that point, I prayed the sinner’s prayer and invited Jesus into my life. As part of his new habit of giving away Bibles, Wang gave Bibles to his father and brother, who have now accepted Christ as their Lord and Saviour. The statistics about China’s poor underline the continuing need for greater access to affordable Bibles. An estimated 200 million people live below the poverty line, with 128 million living on less than $US1 a day. Will you help millions of Chinese Christians put on the armour of God to resist the growing threat of false teachings and heresies?